The South American was sworn as the head of this international organization, which for 75 years has promoted the well-being of agriculture and rural development. San Jose, 15 January 2018 (IICA). On 15 January, veterinarian Manuel Otero was sworn in as Director General of the Inter-American Institute for Cooperation on Agriculture (IICA) for the period 2018-2022. The ceremony took place in San Jose, Costa Rica. 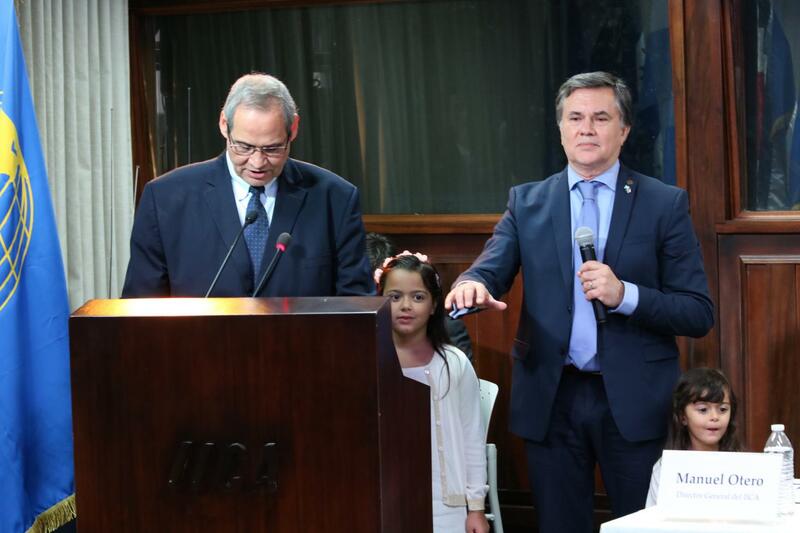 Swearing-in ceremony of the new Director General of IICA, Manuel Otero. In a unanimous decision, the ministers of agriculture of the Americas elected Otero to the position last October, during the Nineteenth Regular Meeting of the Inter-American Board of Agriculture, held at IICA Headquarters. The swearing-in ceremony was attended by the President of Costa Rica, Luis Guillermo Solís; the Assistant Secretary General of the Organization of American States, Ambassador Néstor Méndez; the Minister of Agriculture and Livestock of Costa Rica, Luis Felipe Arauz; the Secretary of Family Farming, Coordination and Territorial Development of the Ministry of Agroindustry of Argentina, Santiago Hardie; and the Chair of Argentina’s Senate Committee on Agriculture, Alfredo De Ángeli, among other senior officials. Otero, who succeeds Mexican agronomist Víctor Villalobos in the post, has a wealth of experience in the fields of science and technology, agricultural health and trade, institution building and international cooperation. With a strong commitment to area-based development and family farming, Otero said he would work to ensure the well-being of rural areas and expressed interest in working with the less developed countries to help mitigate inequality in the Americas. Dr. Manuel Otero has an MSc in agricultural development from the University of London and an MSc in animal production from the Tropical Agriculture Research and Higher Education Center (CATIE), whose headquarters are in Costa Rica; and graduated as a veterinary doctor from the School of Veterinary Sciences of the University of Buenos Aires (UBA), Argentina. Dr. Otero served as the Secretariat of Agriculture’s Agricultural Counselor at the Argentine Embassy in Washington, D.C. and also held the post of Vice President of the National Agricultural Technology Institute (INTA) in Argentina. He previously spent 27 years at IICA, taking up his first position with the organization (as Representative in Brazil) in 1988. He subsequently held a series of other posts at Headquarters (as Adviser to the Director General, Director of Programming and Evaluation and Director of the Andean Regional Center) before serving as Representative in Uruguay and, once again, in Brazil. He is the author of numerous technical documents on international trade, sectoral policies and the modernization of agriculture, including Gestão da água e o futuro da vida no planeta and Uma nova visão sobre a agricultura brasileira, published in 2013.